It's been a Guy Maddin kind of week (see what to do with an hour). That doesn't mean things have been looking blurred and vignetted. Nor does it mean that I've been experiencing vivid memories with weird sexual subtext that pay homage to film history. Just that I've seen two of his movies in a row. While The Saddest Music in the World, a funny and bizarre film is second in my heart to previous Maddin pick Careful, it's one of the most accessible of this master of experimental feature filmmaking. It's got musical numbers and not only does it have dialogue, but dialogue that's snappy and witty. Few artists work in this genre with as much success and, more importantly, almost none works in this genre with such a refreshing, genuine sense of humor. That rare humor takes center stage in Saddest with Isabella Rossellini and Mark McKinney delivering sensational performances, while Maria De Medeiros is adorable, as always. The movie takes place in Winnipeg, which has won the dubious prize of being the saddest city in the world three years running. 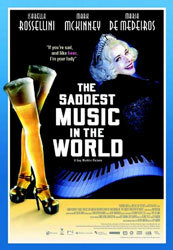 To Celebrate, Lady Port-Huntley (Rosselini) throws a contest to find the saddest music in the world. She also has no legs and receives a gift of beer-filled legs from her former lover (McKinney)'s father who will always love her but can never gain her graces after severing her legs in the first place. If you are new to Guy Maddin, this is the kind of plot line you can expect, and you can also expect to get drowsy. His films have a lullaby quality that you should be prepared for. That being said, there is nothing quite like one of his films and it will open your eyes to the possibilities of the art of movie making.